These days, a laptop has to do it all. It needs to be light, portable, powerful, beautiful, and reasonably affordable. Fortunately, there are a handful of fantastic options that fulfill all or most of those, depending on your needs. Below you’ll find our picks for best overall laptop, as well as the best MacBook for Apple die-hards, the best Chromebook for those who desire an affordable laptop with a super-light OS, and the best laptops if you’ve little money to spend. We’ve also selected the best 15-inch laptop, best 2-in-1, and the best gaming laptop. Why should you buy this: It’s portable, fast, attractive, and reasonably priced. Portable, powerful, and beautiful, nothing offers the same value as Dell’s flagship XPS 13. Who’s it for: Everyone except gamers. 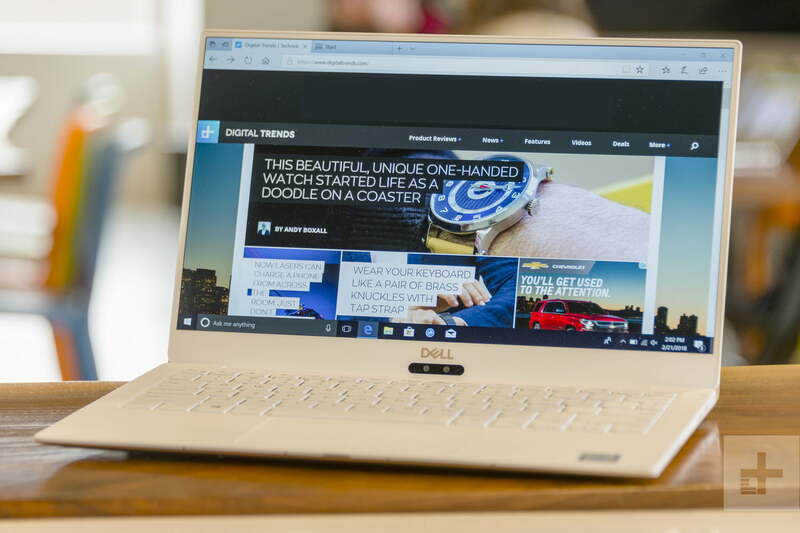 Dell’s XPS 13 has a great look that blends a metallic exterior with a white woven-fiberglass interior. Its design feels premium, yet inviting. The XPS 13 is the kind of cool new toy you’ll be itching to show anyone willing to look. The super-thin InfinityEdge bezel is another highlight of the design. Most laptops have a half-inch to an inch of plastic surrounding the display on all sides — the XPS 13 has less than a quarter of an inch. That’s as functional as it is beautiful, as it makes the system smaller and lighter. Does that make the XPS 13 too small? Nope. The touchpad is as large as the competition and the keyboard is a breeze to use. The system is also energy efficient with a respectable battery size, so it can last all day on a charge in most situations. There’s just one oddity you should know about. The webcam. The bezels are so thin there’s no room for it, so it’s below the display, rather than above. That makes for an awkward angle. Most people won’t care, but it will bug you if you frequently do video conferences while traveling. The two models we tested, the i5 and i7 versions, start at $1,000 and $1,400 respectively. Both feature 8th-generation processors, alongside a selection of solid state drives and up to 16GB of RAM. If you want to opt for something cheaper, you can still purchase the 7th-gen version Core i3 model, which starts at just $800. That’s right: The XPS 13 currently has two versions — the XPS 13 and the “New” XPS 13. The $800 Core i3 edition is only available in the older incarnation, while the new version starts at $1,000 for a Core i5. The new model is thinner and sleeker than its predecessor, but the old one is still a good value. Why should you buy this: You need MacOS and Windows just won’t cut it. Apple’s notebook will appeal to commuters, Apple adherents, and anyone who despises the finicky trackpads Windows PCs are known for. Most people are looking at a Mac for one of two reasons. Either you’re a fan of MacOS, or you’re attracted to Apple’s brand and want to buy one based on the company’s reputation. If you’re in the first group, and Windows 10 just won’t cut it, your options are limited to what Apple currently has to offer. In that case, we recommend you purchase the MacBook Pro 13 without Touch Bar. Why not one of the highly anticipated more expensive models, which have an OLED Touch Bar where the function keys used to reside? In our opinion, the Touch Bar just doesn’t add enough functionality — certainly not enough to justify a $300 addition to an already high price tag. The latest MacBook Pro models all feature 7th-generation Intel Core processors, like a lot of the other offerings on this list, so you do get quite a bit of bang for your buck. But they’re still a little more expensive than they need to be, and if you’re on the fence about MacOS you might want to give Windows 10 a chance — if for no other reason than to save yourself a little cash. Aside from build quality and industrial design, Apple does justify its high prices with one important feature: Customer service. The company tends to cover defective hardware that other manufacturers might refuse to service, and you can take your Mac to any Apple Store if you need help. Given the MacBook Pro’s robust build, and reputation for longevity, it’s a nice safety net to have — especially when your Mac gets old and you end up losing your warranty paperwork. We’re not expecting to see a major update to the MacBook Pro this year, but you’ll probably see an update to 8th-gen Intel processors. Why should you buy this: You want an inexpensive, but well-built laptop. If you’re looking for a cheap laptop to use as a second PC, you can’t go wrong with the Samsung Chromebook Pro. Who’s it for: Students, people who need only basic functionality, anyone who wants a cheap laptop to use as a second PC. Chromebooks — laptops that run Google’s Chrome OS — have become a popular budget laptop over the last few years, and for good reason. The Samsung Chromebook Pro is a great example of their strengths: It has a 2,560 × 1,600 display, an Intel Core M processor, and plenty of memory — solid specs at a decent price. Indeed, if you’re looking for a budget laptop, Chromebooks as a category are a good choice to look into. But since these systems rarely sell for north of $600, their price tags do bring limitations. You won’t find a Chromebook with a lightning-fast quad-core processor, a fast solid state drive, or an optional discrete GPU, for example. Even if the best Chromebooks were equipped to compete with the best laptops, the operating system would hold them back. Chrome OS, which is designed around Google’s Chrome web browser, is wonderfully simple and intuitive. While it used to only run extensions and web apps, that has been expanded to now include everything in the Google Play Store. That means all the games, apps, and services available on your Android smartphone, are now available on Chromebooks like the Samsung Chromebook Pro. The Samsung Chromebook Pro has a variant in the Chromebook Plus, which now has a second generation that can be configured with an Intel CPU rather than an ARM-based processor. Why should you buy this: You want a great laptop and a good tablet. The Surface Pro is the best Windows 10 detachable tablet on the market, offering the best platform for taking extensive handwritten notes. Who’s it for: Anyone who needs versatility on top of performance. In the past couple of years, 2-in-1 laptops have gone from an acquired taste to completely mainstream. If you’re not sure about laptops-as-tablets though, the Surface Pro is the one to change your mind. First and foremost, it’s a stylish, lightweight, and powerful tablet that pulls double duty as a laptop. Worried about the Surface Pro as a laptop replacement? Think of it as a laptop with a detachable keyboard. Seriously, this thing has the power to do anything you need a laptop to do and more. With a full version of Windows 10 and a super-light form factor, the Surface Pro is just as capable for a workday at the office as it is for laying on the couch watching cat videos. Coming in at just 0.33 inches thick, and weighing 1.73 pounds, it’s also easily the most portable laptop on this list. Toss it in a bag and you’d never notice the extra weight. The form factor is even more impressive when you consider the power it packs. There are a few different configurations with different price points, starting at $800 for students and topping out at $2,700. No matter which configuration you choose, you get the 7th-generation Kaby Lake processor under the hood — our review unit was one of these top-spec machines. That extra oomph really shows. Not only did it perform spectacularly well in our benchmarks, it’s excellent as an everyday workhorse. It’s quick, snappy, and versatile, everything you could want out of an ultra-portable laptop — plus it’s the best tablet around when you need it to be. There are a number of rumors pointing toward a redesigned version coming in 2019, as well as an 8th-gen CPU update later this fall. Why should you buy this: You want an affordable Windows PC that’s also a joy to use. The surprisingly affordable UX330UA is competitive with laptops that cost twice the price. Who’s it for: Everyone except gamers, other power users. The Dell XPS 13 starts at $1000. That’s often where you’ll get a good laptop for the money you spend. However, the average selling price of new laptops has hovered around $600 for years. One option is to watch out for a sale. You shouldn’t have to wait long. Refurbished models have sold for as little as $470, and budget laptops sometimes dip near the $600 mark. Keep an eye out for coupons on Dell’s site and for sales at major retailers including not just the usual suspects but also the Microsoft Store, which carries a selection of the best Windows laptops. If that doesn’t work, then we suggest the Asus ZenBook UX330UA, another ultrabook we’ve awarded an Editor’s Choice to. The ZenBook isn’t as powerful as the Dell XPS 13, and doesn’t emulate the Dell’s strikingly thin bezels. But otherwise, it’s a powerful machine, worthy of our best laptops list. And its value is incredible. The base model, which is routinely priced at $750 on Amazon, has a 8th-generation Intel Core i5 processor, 8GB of RAM, and a 256GB solid state drive. That’s twice the memory and storage of the $800 Dell XPS 13 — and better battery life than what you’ll find in other competitors. Although you can still buy the laptop on Amazon, Asus and other retailers appear to no longer sell it. Why should you buy this: It provides a fantastic gaming experience on the go. The Alienware 17 R5 is easily one of the most powerful laptops on the market today. Who’s it for: Gamers who value performance above all. If you want the best gaming performance on a laptop, look no further than the newest Alienware 17. Among the first laptops on the market to feature a six-core Intel Core i9 processor, the Alienware 17 also has an Nvidia GTX 1080 graphics card, and 32GB of RAM. It’s probably the most powerful laptop we’ve tested to date. With a GTX 1080 graphics card and that monster of a processor, which is unlocked and overclock-ready, the Alienware 17 R5 made short work of just about everything we threw at it. That’s because of the incredible amount of power Alienware has crammed into this laptop. Between the Core i9 and GTX 1080, you can run just about anything at just about any resolution. The display tops out at 1440p, but it has a refresh rate of 120Hz, so your gameplay is just impossibly smooth. Plus, with hardware like this, we had no trouble hitting at least 120 FPS in most games. The design is definitely one you’ve seen before if you’ve ever laid your eyes on an Alienware laptop, but it still works and the build quality is as excellent as ever. Why should you buy this: You want a sleek PC, but also need excellent performance. Stylish and slick, the Dell XPS 15 is a surprisingly robust gaming platform. The XPS 13 is great, but you may want something with a larger display. You’re not alone. Sales figures have continually shown 15-inch systems beating their smaller rivals. We think this is partially because good, small laptops aren’t cheap — but also because some people just want a bigger display. There’s nothing wrong with that. Fortunately, Dell also has the XPS 15. It’s great for all the same reasons as the XPS 13, and because it’s larger, it can be optioned with the fastest hardware available today — including a quad-core 7th-gen Intel Core i7 processor, Nvidia GeForce GTX 1050 graphics, and a 4K display. It’s easily the best all-around 15-inch laptop on the market today. The XPS 15 has recently been refreshed with 8th-gen processors, as well as the inclusion of the GTX 1050 Ti in higher-end configurations. Need more options? We’ve also got guides to the best 2-in-1 laptops and gaming laptops, as well as the best cheap laptops for those looking to save a buck or two. You’ve read our laptop reviews. You’ve read our conclusions. And now you’re wondering how we came to them. Good question. Reviews often lack context, which is evident in the wildly different scores some laptops receive from different publications. Conflicting opinions can actually make buying a laptop more difficult if the review’s criteria isn’t made clear. Allow us to lift the veil. Here we’ll explain the benchmarks we use for objective testing and the perspective from which we approach subjective topics. We don’t expect everyone to agree with our opinions, but we hope that sharing our process will leave you better equipped to decide what laptop best fits your needs.